I really love this one, hahahaha! Thanks a lot! Love this image! The two butlers together is a real treat! Ciel looks pissoff at alois like get off of me! claude has the knives. sebastian just talking nice! damn, they're so ... UGH. Lovely. 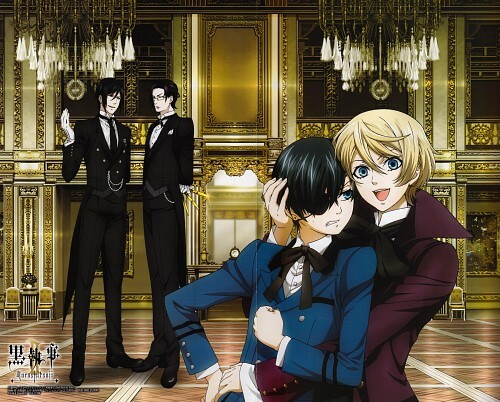 Anyone else noticed SEBASTIAN IS STEPPING ON CLAUDE'S FOOT. wowww I love this scan. Ciel and Alois so cute! Gosh.. I love it! VEEERRRYYY LOVVVEEE ITT! OMG! This is absolutely cute and wonderful scan! :D hehehe... What is Alois doing? And why is Sebastian calm? :D Ciel is my! let him now! OMG I LOVE this picture! Gosh Ciel looks so cute with his 'Get off me look' Alois is all cuteness, I love Claude with the knifes behind his back and Sebastian just sent me into laughter with him stepping on Claude's foot and looking so calm! Bet you he must have knifes behind his back too, our beloved first black butler.